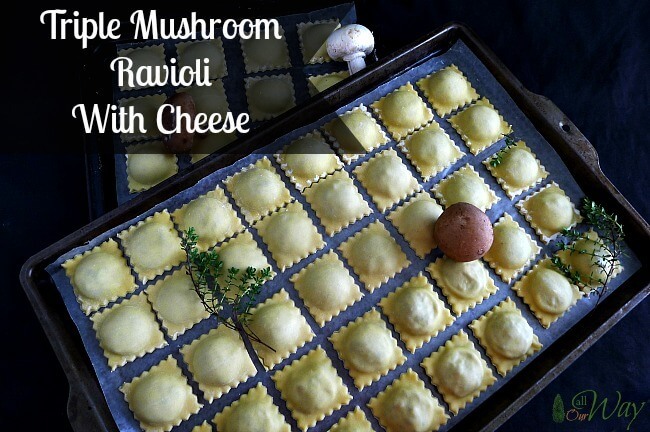 It wasn’t until we were given a ravioli maker for Christmas, quite a few years ago, that we discovered the joy and ease of making our own ravioli . . .
. . . ravioli such as the Triple Mushroom Ravioli with Cheese. Our children decided a ravioli maker was a perfect gift. They knew we enjoyed making fresh pasta and so they thought we’d like the challenge of delving into new territory such as ravioli making. And we also believe, that down deep, they hoped they would benefit from their generosity. . . The fillings you can make for ravioli are limited only by your imagination. And if you want to go even further in your ravioli adventure, you can expand the variety of your ravioli by making flavored, colorful pasta such as spinach, beet, or tomato, for example, to wrap around your filling. Our three mushroom ravioli with cheese was originally a recipe for a Mediterranean – style first course or appetizer. We changed it so that it would be just a filling for our pasta. We used a combination of 18 ounces of fresh mushrooms: white button (crimini), portobellos, shiitakes. We chopped the mushrooms. In a large skillet, we sautèd them in olive oil with fresh thyme, garlic, salt, and pepper for about five minutes. We then simmered the mushrooms in dry white wine ( you can use chicken broth) until the mushrooms are tender and no liquid remained. After the mushrooms cooled a little we added the ricotta, Parmesan cheese, and fresh snipped chives. It could be easily be cut down to whatever amount you like. The mushroom ravioli filling recipe made 68 ravioli. When we’re making these delicious little-stuffed pillows it looks like a ravioli assembly line. My Honey is rolling out the pasta sheets and I’m filling the ravioli. One thing you do need to be aware of — don’t overfill the pockets — the top sheet of pasta will not stick to the bottom if there is too much filling. The complete tutorial on how to assemble the ravioli plus the pasta recipe is here. 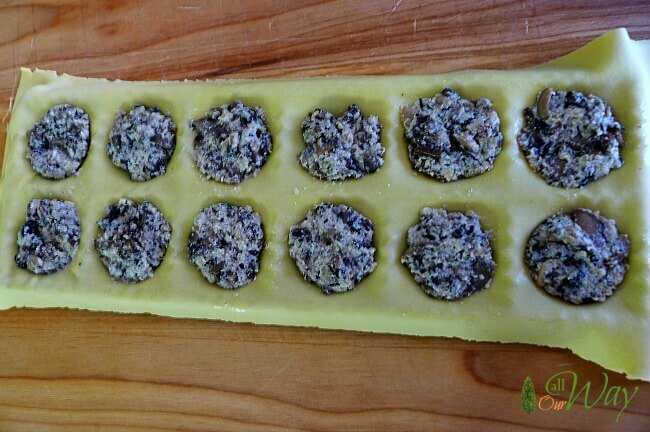 When we finished making the three mushroom ravioli, we put them on a tray lined with wax paper and set them in the freezer. They freeze individually and it’s so nice to have them on hand. We find that ravioli is a lot cheaper to make than to buy from the grocery store. The triple mushroom ravioli are ideal for a quick weeknight meal or for a special dinner with guests– your guests will think you’ve been cooking up a storm just for them. Another plus is that making your own pasta dough is a lot better for you. Have you ever looked at the ingredients on the back of the pasta packages? Pasta should be just flour, water, salt and sometimes egg. If you have a box at home, look at the back of your pasta box — I bet it has more than the three or four ingredients. I will admit that we do purchase boxed pasta to have on hand, but heavens, the fresh stuff is so much better. 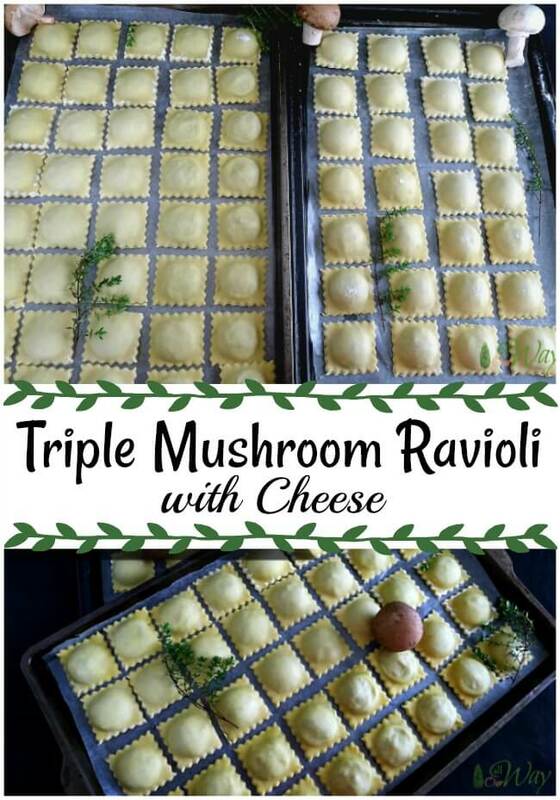 We hope you’ll try making the Triple Mushroom Ravioli with Cheese. 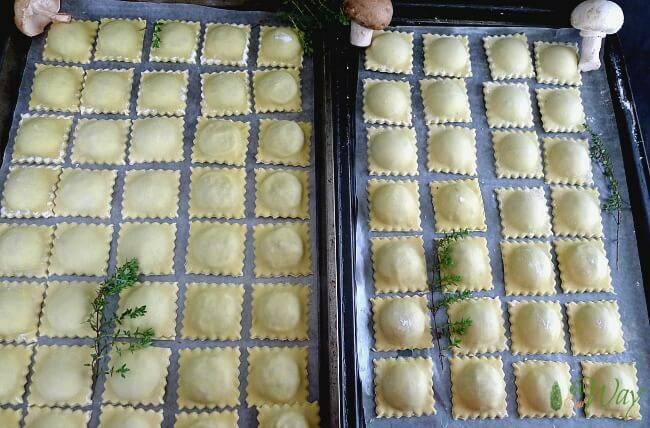 Once you get the hang of making ravioli it’s just a matter of changing the filling to make countless varieties. In the coming months, we will be posting additional fillings — we hope you’ll follow along. 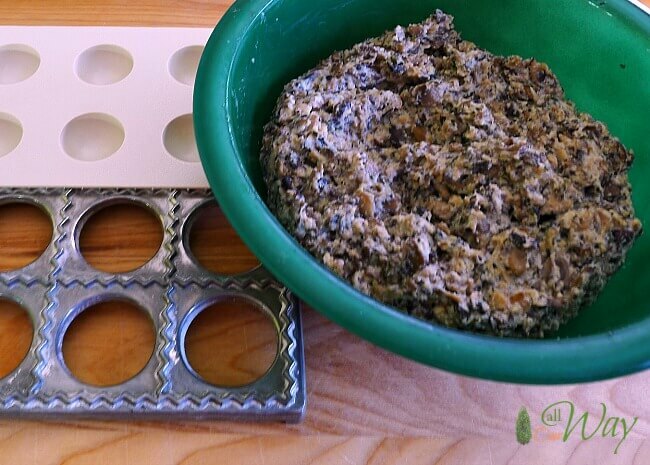 A delicious earthy filling made by combining crimini, portabellos and shiitake mushrooms. The ricotta and Parmesan cheese add a rich quality to the ravioli. 3/8 teaspoon pepper -- don't worry about being exact. In a large skillet heat the olive oil. 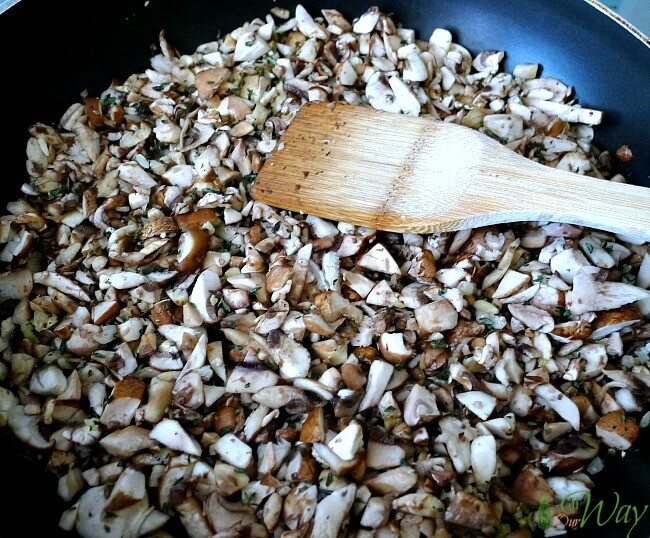 Add the chopped mushrooms, garlic, thyme, salt, pepper and saute until the mushrooms release most of their moisture about 5 minutes. Add the wine or broth and simmer uncovered about 10 to 15 minutes or till mushrooms are tender and no liquid remains. In a small mixing bowl stir together the mushrooms, ricotta, Parmesan cheese and chives. Set aside until ready to fill the ravioli pockets. Fill the ravioli according to the directions on the Meat and Cheese Filled Ravioli post. When ready to prepare gently add the frozen ravioli to simmering salted water. Once the ravioli float, they are ready for whatever sauce you like. *Set the filled ravioli on waxed lined cookie sheets and place in freezer. Once frozen put them in a zip lock bag inside of a freezer container. The double lining will prevent them from getting freezer burned. Our ravioli never lasts that long. 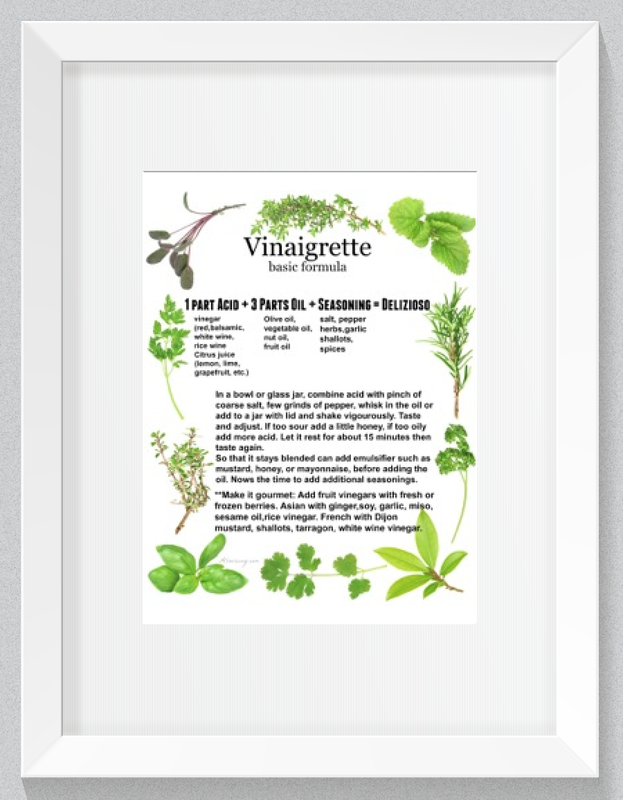 Note: Recipes and content from All Our Way is copyright protected. Please do not use content or recipe without prior written permission. If you want to share the information please link to this post. Grazie. Oh wow, I absolutely love your ravioli recipe! I am loving that these ravioli are made with triple mushrooms. You explain the process so well and the end result is just delicious! Such a great savory meal and you make it look so easy to make. Beautiful pictures, very helpful post and this recipe has my mouth watering!! Mushrooms are my absolute favorite so I’d be willing to wager that these mushroom raviolis are EXTRA good! I’ve never made my own pasta before, in part because it always sounded really difficult, but I really want to give it a try now! WOW! Ravioli from scratch? That looks so hard but sooo delicious!! I may just have to attempt to try making homemade pasta myself! I am DYING to make my own pasta dough! And, of course, ravioli. One of my favorite dishes of all time. Yours are so perfectly made with your ravioli maker! I can’t wait to try this recipe AND your pasta dough recipe! I’m saving your filling recipes, because they sound so good! And a bag of ravioli in the freezer is just so convenient! Wow mushrooms make such great filling,they are always my favorite! This is a comfort meal altogether,great effort! Beautiful ravioli! My husband and I are pasta nerds. For “date night” we’ll make pasta and drink wine. 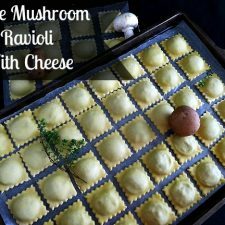 The ravioli mold you’re using is my favorite for ease and consistency but they are easier to overfill that using a ravioli stamp or cutter. Thanks for laying out the whole process. It really makes the process seem doable! Hi, Gene! It really is very easy and fun! The best part is you get to eat a delicious dish. Wow! You made all of this from scratch?!? I am so impressed! This sounds like the perfect dinner idea! It certainly is good, Cathleen. Hope you give it a try. Hi, Anna! You don’t have to do either for them to set. They should set easily right on the counter. We put them in the freezer and once frozen we put them in freezer containers or a freezer bag. Normally we’ll do a two process — put freezer wrap in the plastic freezer container and seal them tight before putting the lid on. This keeps them nice and fresh. We always make a lot to have on hand. You don’t have to make as much as we do. I’m so inspired by this! I’ve never made my own pasta, but these look so delicious, and fun to make. Pinning for later! Hi, Vanessa! Making your own pasta is fun. We really enjoy putting on some smooth jazz and putzing around the kitchen. Hi, Lauren! Make him the one with cheese and meat and some for you. Although I foresee the problem — them getting mixed up. That wouldn’t be good. Whichever ones you make they are good. Wow!! I am so impressed!! 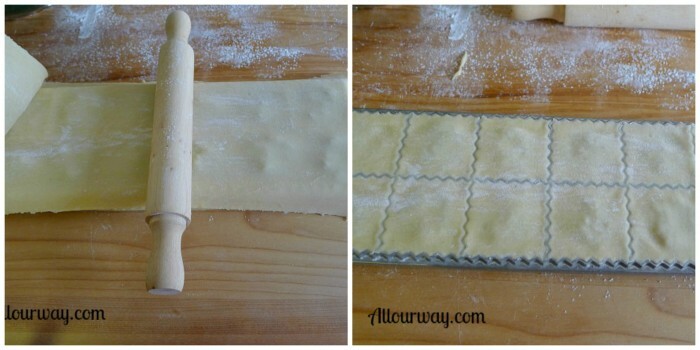 Making homemade ravioli has always seems so intimidating to me but your post shows how easy it is. Beautiful recipe and very helpful! Hello, Heather! Thank you-you’ll have to make them. Truly, they aren’t difficult to make. Ravioli is like an ultimate comfort food made with style. Very inviting presentation and all those mushrooms… perfect filling! Thank you, Ruchi! The filling is a great alternative to cheese or meat. my husband would love this recipe as he is a major mushroom fan. I haven’t made ravioli, definitely something to think about. I hope you give ravioli a try, Mirlene. They are really easy to make. I love mushrooms anything and this mushroom combo sounds so delicious. We love ravioli in our home and I usually make it on the weekend. Marisa, I always envy the cool Italian gadgets you have. This ravioli pan looks awesome. Hi, Veena! The ravioli maker is really inexpensive – we really love using it. Thank you, Karyn! That is very sweet of you. Thank you, Adriana! We do love our mushrooms any way we can get them. I havent had homemade in so long you have inspired me.. nothing beats it. We dont eat much pasta anymore being off carbs now for 1 year its tough being an Italian but sometimes you just have to give in and I would for these for sure! Hi, Claudia! We save the ravioli for special meals. We have to watch our carbs but we indulge every now and then. Homemade ravioli look so absolutely amazing. You make it so easy and now I’m temped to try it myself 🙂 Mushroom filling sounds very meaty (without the actual meat), filling and comforting. Hello, Pavani! The mushroom filling is really fantastic. I hope you give it a try. This recipe is amazing! 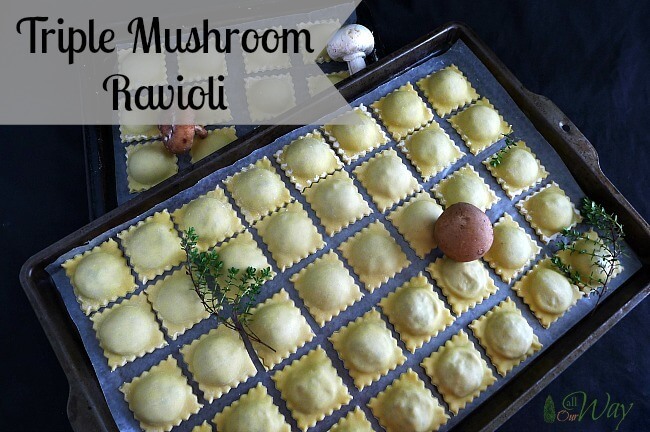 I haven’t made fresh pasta/ravioli is so long – my fiance will love this! Mushrooms are one of his favorites! Hello, Lauren! Won’t he be surprised that you made it just for him! Looks delicious! I’ll have to give it a try! If you like pasta, you’ll love these ravioli! Of course you make your own pasta!! I’ve had fresh pasta before . . . and it’s world’s better than what I buy in the store and specialty shops. My Aunt gave me a pasta machine last year, and I’ve wanted to make pasta for months now, but don’t know where to begin. I need to look at YOUR recipe and technique and see how “easy” it is. I LOVE that ravioli press that you shared in the post. That looks like it would make making raviolis much easier and faster! I buy mushroom stuffed raviolis for my husband from Trader Joe’s. I haven’t tried them yet, but he likes them. I think he’d LOVE home-made ones like yours though!! I need to figure it out though, because my mind is running wild with thoughts of making creamy ricotta filled ravioli with a light lemon cream sauce. YUM! If you have any questions at all please let me know. Sometimes a person does things tacitly thinking it is easily understood when perhaps I didn’t make it clear. You’ll love making those ravioli — the little contraption will last for years. I can just imagine those ravioli you are making and they do sound yummy!! Big Hugs to you!! Thank you for your sweet compliments and I’m glad I bring a smile to your face. Your ravioli look so delicious and are perfect! I’m planning to make some for a friend’s birthday on Monday. They look great and not too complicated at all. I have one of those attachments/contraptions somewhere. I should make time to dig it out and make some. From one Marisa to another. Oh do find the ravioli maker!! As I mentioned it was a gift from our kids and we’ve used it so many times. It doesn’t wear out — thank goodness. Plan to make lots more ravioli. Let me know what you make. Hi Marisa, you are so right, nothing like homemade pasta. I have been spoiled because my mother-in-law always made it, unfortunately she isn’t up to it anymore. You are really encouraging me to give it a go, and I shall with your recipe! Looks amazing, great photos. My favorite pasta, Marisa. I have the same ravioli press as you do. I should use it more often. I love your filling. What type of sauce do you like to serve over these ravioli? We like to use a simple Marinara or Tomato Basil sauce to compliment the mushroom ravioli. But there is another non-tomato sauce we have in the works — as soon as we have it to our “liking” we’ll post it.